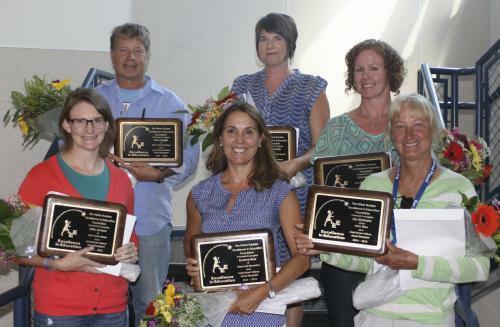 2014-15 Linda Brown Fellows Award recipients: Photo left to right (top row): Dave Goggin, Tahoe Lake Elementary; Rachel Koles, Alder Creek Middle School; Betsy Redmond, Alder Creek Middle School (bottom row) Katie Jamison, North Tahoe School; Suzanne Beye, Tahoe Lake Elementary; Lisa Abrahams (Liz Ewing accepting on her behalf), District Nurse. This educator has been with the district for 30 years and is the foundation of our healthy schools from behind the scenes. She started the STEPP program, Sonrisita program and has help to implement dental screenings, vision tests, and immunization programs to emergency health protocols. There is never a lull in her dedication and has an amazing sense of humor! Suzanne led the charge and challenge with the implementation of Transitional Kindergarten while incorporating the new Common Core State Standards. Her boundless energy, commitment, and creativity have provided success for an entirely new district grade level. Dave Goggin is inspirational, encouraging, passionate, smart, humble and dedicated in every day that he teaches. Students have life long memories in his class of projects they have solely completed which has increased student confidence. The passion Dave exerts allows students to go above and beyond in all areas. Katie provides such an inspirational environment in which all students want to learn. This charismatic educational teacher has high expectations for students’ academic work, love and respects students, and consistently presents well-planned and interesting lessons. Students develop both a strong sense of philanthropy and leadership with the great programs Katie provides. Students are filled with life lessons which increase confidence that provides lifetime skills. This educator has done an amazing job in building a positive school culture with other staff, students, and parents with her courage, empathy, and emotional strength. The programs’ she has implemented allows students an open communication platform with positive adult role models. Students are given the skills to resolve issues before they lead to devastating decisions. She has been instrumental in this positive culture at Alder Creek Middle School. Betsy is a master at teaching and demonstrating to students how they can build resilience. Students are encouraged to get back up when they are “underwater”. Betsy teaches students how to overcome obstacles and get things accomplished. Her sense of humor goes a long way with both students and staff and her passion always shines through. Bert has had a double workload at his school site however the quality of his work has not faltered. His school facility is always in outstanding condition and he never misses the opportunity to fix things that need to be completed. However, his work does not end there! He has a great rapport with soccer players in getting them ready for fall soccer. Bert achieves this not by only the rigors of practice but by important conversations with students regarding grades, attendance, completing homework and positive attitudes. Always with a smile and great communication to staff, parents, and students, Lindy is always professional and kind. She goes beyond her job responsibility with outstanding tasks of assisting students with individual needs as well as bringing food over to a family when in stressful times. Her positivity allows for a successful environment to the entire school and she always brightens the day! Mariela represents the impact on being an instructional aid and how her efficiency leads to achieving student success. She has gained the talent and trust of many students and has empowered them to finish assignments to completion. She has provided motivation to become better community members and to look past any obstacles that come their way. When it comes to embracing anything to help an entire school, Leo is always present. His first response is always “No problem” and he is consistently available to assist with all school facilities, staff, and PTO events. His pride is what he does is outweighed by the love and respect he has for all staff, students and parents. This Instructional Aid’s resourcefulness is an integral part of the special education program success at her school site. She truly goes above and beyond by creating and adjusting lesson plans to fit the needs of this special population. She knows exactly what her students respond to and is creative in keeping these students engaged. Evelyn takes her own time to adjust a lesson plan in meeting an individual needs which greatly benefits the student success. Nominations are reviewed and selected by a committee. Recipients of the Linda Brown Fellow (certificated staff) and Star (classified staff) awards each receives a $1,000 personal cash award. Additionally, the Linda Brown Fellow recipients each receives a $2,000 grant to be used for academic purposes. The award presentation is made at the TTUSD back to school "convocation" staff event in August. All nominees, regardless of being selected or not, receive a copy of their nominations. Thank you for taking the time to acknowledge the exceptional educators in our school district.